Recently I was sent some polishes from Sally Hansen's new Miracle Gel range to try out! I'm pretty excited at the appearance of these on the market - from what I've experienced so far they help bridge the gap between gel polish and normal nail lacquer. Miracle Gel has a two-part system - the colour and the top coat (no base coat needed). These products are new to New Zealand; they came out in Farmers this month, and will be available in pharmacies from November onwards. There are twelve different colours available; you can purchase the polishes separately for $16.99, or grab a duo pack (includes the top coat) for $19.99. I'd recommend buying a duo pack and adding in single colour purchases as you need them. Short answer, they last longer. "The Miracle Gel manicure contains patented Tube Technology. This allows a higher level of actives and continuous care ingredients to release into the gel lacquer film, prolonging the integrity of the film resulting in beautifully durable, shiny nails. The advanced colour coat and top coat formulas contain an oligomer, and the top coat also contains a photo-initiator... As the manicure cures over time, it becomes more durable due to the increased hardness of the film. So LED/UV lamp curing is not necessary, only natural light." They're easily removed with normal polish remover, no soaking or filing required. Now for the swatches and review! Street Flair is a beautiful lavender purple. I found this to be a really opaque polish, completely hiding my quite prominent whites after just two coats. The consistency was just like normal polish, and it applied in the same way. The top coat really gave it a beautiful shine, and was quite gel-like (no surprises there, I guess!). Shock Wave is a bright Barbie pink, and slightly less opaque than the other one - this took three coats. However, I liked the colour more so I chose to wear this one when testing out the polish's longevity. Sally Hansen Miracle Gel is meant to last up to 14 days. It's important to note those words "up to." As a nail tech, I know it really depends on the wearer, and what they're doing during that time. For general info, when wearing any kind of polish or enhancements, it's best to limit/reduce your hand's exposure to chemicals and water. If you do your dishes by hand, your nails won't last as long. Spa pools are a big thing to be aware of too, as your poor hands are being soaked in both water AND chemicals! There are many other ways to look after your nails and grow them long (I really should make a video about this), including not using them as a tool to pry things open. Use a spoon to open can tabs, never your nails! Be more careful when doing your laundry and general household tasks. Growing your nails long isn't all about great genes and expensive products - it's about making it a priority. After saying all that, I didn't really make looking after these nails a priority. I scrubbed the bathroom ceiling with mould killer, did heaps of dishes, pulled a few weeds (another no-no) and was generally a bit rough on them. Normally nail polish lasts about two days on me, so if this stuff could last longer than that I'd be impressed. My nails at the beginning of my trial. In the end, they lasted about six days before showing a bit of wear. This nail was the only one to get a chip - it's the thumb on my right hand, and therefore my most used/abused nail. If I didn't need to keep blogging and coming up with new content I could have left it on a bit longer, but because of my schedule I decided to take it off. I was pretty happy with six days. It proved that this Miracle Gel was a decent step up from normal polish, as I wore it for three times as long as normal polish before having problems. I know that if I had a) been more careful with my nails and b) wrapped my tips, it would have easily made it past the one week mark, if not longer. If I have a spare couple of weeks some time in the future I'll have to try this out again! Here are a few shots of the rest of the nails, at the end of the trial. As you can see in the above photos, tip wear was the biggest problem, which, as I mentioned above, could be resolved by wrapping your tips. This is when you brush a very thin layer of polish on to the ends of your nails as well as the nail plate. I painted my toes with this polish as well - they're still going strong three weeks later! Overall, I was happy with the results this polish gave me. They're perfect for a polish addict who's going away for a week and doesn't want to have to worry about her nails chipping in that time. While they didn't last as long as I'd like them to have, I completely understand the reasons why and know how to make them last longer in the future - information I've now been able to share with you! Hope you found this helpful if you're thinking about trying these out. 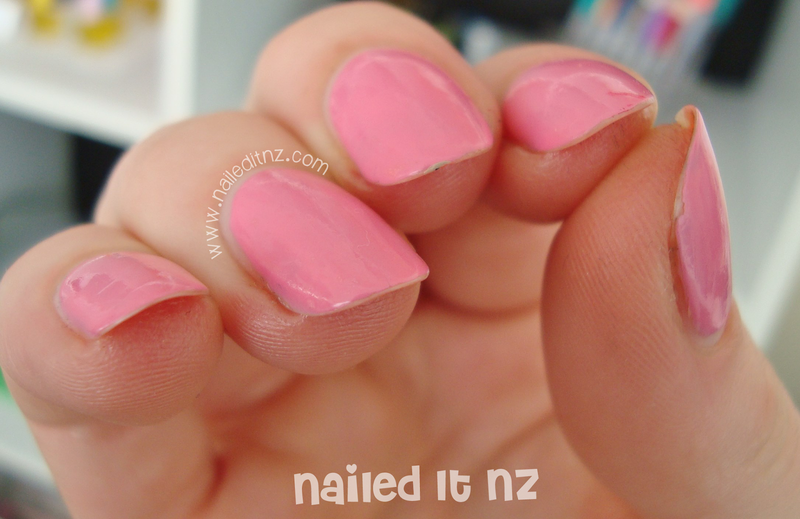 These Miracle Gel polishes were provided to me for honest review by Sally Hansen NZ. As always, all opinions are my own. There nice and I like how wearable the shades are too. Wow! Your experience is so different to mine... I'll explain more when I do my review, but basically my color took 4 coats for opacity and I had a big chip on my right thumb the very next day. I want to purchase a different color and see if that makes any difference! Wow that's unfortunate! I'll have to try out some other colours and see if they vary... I was so happy with my ones! How do you safely remove the gel polish without damaging yournails? I've had such bad. Luck with the pro ess in the past and have avoided gels manicures be ause of this. I like the colours but am disappointed with the longevity (I must admit that I am a bit rough with my nails). My new, shiny nails only last me 3 days. I have tried using the top coat as a base coat as well after the first try, but it didn’t make any difference to the longevity. Now I am trying cleaning my nails with an alcohol swab, see if that makes a difference. I have also got a box of rubber gloves on the sink. I am a lot in water washing this ’n that by hand. See how it goes. There should be some information on the Sally Hansen stand about how to care for your newly manicured nails, as not everybody has a computer.